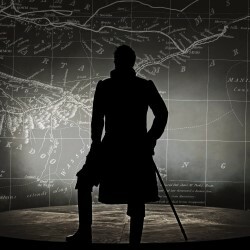 The true story of Mungo Park, idealistic Scottish explorer and his journeys by foot to the heart of Africa is told by three talented performers. Matthew Zajac, probably best known for Dogstar’s excellent Tailor of Inverness takes the role of Mungo, for the most part a stoic calm centre around which the frenetic energy of the rest of the production circles whilst the other two performers slip easily through a vast range of diverse roles with great energy and humour. The story begins in Scotland. Mungo is called to lead an expedition to find the source of the Niger and heads off into Africa where he encounters kings, makes friendships, experiences great hardship and returns back to report on the direction of the flow of the Niger. Back home he marries and has a family before being lured back to lead a further, larger expedition to Timbuktu and beyond. The expedition is a disaster – his best friend dies, all 40 soldiers with him perish and ultimately, after failing to get into Timbuktu and continuing further downriver, exhausted and bereft he drowns. We are told at the start that we are going to experience the full Hollywood treatment of this epic story – an unlikely boast given the empty stage and black walls. However, from the moment we first catch sight of Mungo, dangling from the ceiling we realise that this production is not going to be constrained in any way. The black wall becomes a chalkboard where plans are sketched and maps hung, the circle on the floor turns out to be a turntable which is used to great effect throughout as Mungo moves along his epic journey. A ladder becomes a boat, another a crocodile, the metal pole for the turntable becomes a musket. Every tiny dramatic decision has been thoroughly thought through and the production is stronger for it. By the stunning ending where we see Mungo plunging down the waterfall to his death I was exhausted – the frenetic pace, the laughter and the emotion of the story and the physicality of the performance left me feeling as if I’d lived the journey myself. I saw the show on the preview night and it still needs tightening up – much of the production is brilliant and inventive but other parts make little sense (brownies) or are not fully realised (the blackboards , used to great effect in the first part are forgotten about as the story winds on). The parts of the story based in Scotland are not as strong as the parts set in Africa and some of the characters need to be more fully fledged to make them more credible. However I think this production will just keep improving. This show is exactly what you hope to see at the Fringe – brave, innovative and wildly entertaining.